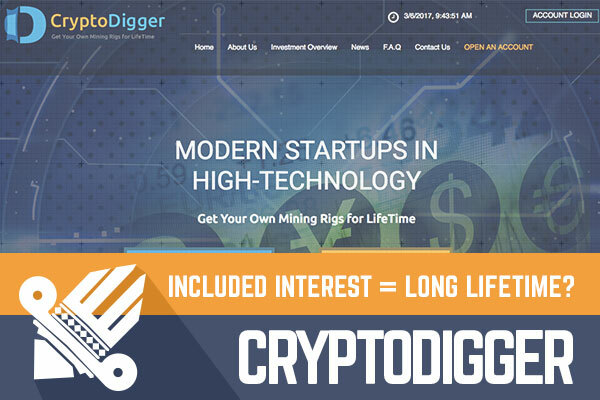 DavidNews HYIP blog - News & Reviews: CryptoDigger - Included interest = long lifetime? CryptoDigger - Included interest = long lifetime? 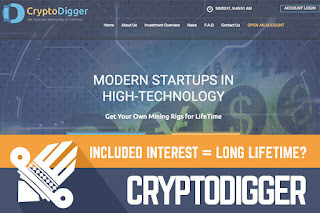 CryptoDigger was added among Gold Digger, sorry, among Golden Stage listing and I reinvested in CryptoDigger $400 exactly on the Valentines day on 14th of February. And I'm glad that this project has chosen DavidNews.com like the main monitor starting from the first day online and even there is not that much hype around this project online there is still something to say about it, read more in the following review. As you see in CryptoDigger project administrator, have invested quite a lot of capital for development. Also for this project administrator have incorporated company and as proof of that, we can see green SSL bar in our web browsers. The good thing is that administrator have started advertising with personal budget and have purchased all the right spots to be noticed in our investment industry. Of course, I do not know if he does not also advertise outside the online investment industry, but I would not be surprised if he would do. Of course, project overall is quite standardized and does not stand out among other giants, but as you know design and features in many cases are an irrelevant important factor, and many "regular" projects show us way better results than the shiny stars. I would like to add that project still is quite fresh, and if the administrator would like to earn, he knows that at first, he needs to put investors in profit. If that will happen then I'm quite sure that sky is the limit for this project, so let us take a look at investment plan what is the main reason why you or anyone else would invest in this project. So, the project offers only one investment plan, and it is a quite simple one. It starts from $10, and you will make straight 3% daily for 50 days. What does that mean for us - it means that within 50 days we will make 50% profit over here and I believe that is a good amount of profit. Initial deposit as you understand will be included in the payments, and that is significant step to increase the potential lifetime and likeability of this project. One more thing - you will be able to invest with all main payment systems of today, but I must inform in advance that payments will be paid manually, but from my experience, I can say that they are paid in a reasonable timeframe. Although I do not see huge activity among this project around the web, I believe that it surely have all the right ingredients to be a great project. As you know, sometimes it is smart not to be a sheep and not to jump with others where everyone invests and choose some not that popular projects that in the future can get big. Of course, there is high risk involved in this project, but to be honest, there is no safe HYIP out there. To be safe you should deposit in the bank, but past has thought us that also banks are not that safe actually. In any case making a deposit or not is up to you, but remember only to use funds that you can afford to lose because the project can be over even overnight. Investment plans: 3% daily for 50 calendar days, initial deposit included in the payments.